As many of you have already noticed with the ads appearing on your Instagram feeds, the image-centric social network has begun monetizing its platform here in the Middle East. According to the latest earnings call, Instagram’s ad revenues will make up 5% of Facebook’s mobile ad revenues this year, and that share will increase to 14.0% in 2017. This is thanks in part to the new advertising API, and the projected revenue is expected to rocket to $2.8 billion by 2017, leaving even giants like Twitter and Google in the rearview mirror in the U.S. market. So what does that mean for advertisers? And why does it matter? Instagram was a platform that, for me, was a bit like Google: you simply discovered it. From the platform’s launch in 2010, Instagram relentlessly focused on creating a user ecosystem where the individual became part of the conversation within a user-friendly experience. Unlike Facebook, Instagram has held out: to date, there is no evidence of an Edge Rank or algorithm-type function, which would pre-determine what users will see. If you follow someone on Instagram, you’ll see their posts– without filtered results. And while it’s a stream-style feed, like Twitter, it’s not nearly as fast moving. Depending on how many people you follow, you can easily log in once or twice a day and catch the posts of everyone you follow without missing anything, making it quite a refreshing, unaltered experience for the user. Instagram also makes it so easy to like a post. Users can easily double-tap anywhere on the image while scrolling. They don’t need to navigate or maneuver to access the like button. Furthermore, it’s super easy to upload images and engage with others, which makes the whole experience ideal for today’s online consumers. So Why Is Instagram Special? Part of Instagram’s appeal is that the visual stories you are seeing are true reflection of those you were following despite the filters. For me, Instagram immediately felt more real and raw, and as such, the immediacy of Instagram was so appealing. Each time I opened the app, I felt like I was on a personal journey wherein I had found Instagram, and walked into a secret garden of knowledge and wonder. I became an instant insider to the beautiful glimpses into what was going on inside a house on Casa Vogue Brasil, or into Nat Geo’s breathtaking windows of the marvels of our natural world. In short, what Instagram provides me, as a user, is a very unique approach to curating content –the platform combines beautiful visuals within a simple format– a formula that seems to work across the board! As a seasoned communicator, I immediately saw the marketing potential of image-based marketing on Instagram– pictures literally tell a thousand words, and we all know the science of storytelling through visuals. In today’s hyper connected world, where we are trying to capture the attention of an audience with the attention span of a gold fish, you have to stand out, and beautifully crafted imagery seems to work. Don’t believe me? Just look at the incredible momentum that Instagram has managed to gain both globally and regionally. Sure, Instagram might share Facebook’s scale, (Facebook currently has a whopping 1.45 billion users), but it’s still a seriously formidable platform to stimulate reach, when you compare it to Twitter or Pinterest. Why? Because Instagram really does deliver different experiences which provide deeper engagement and action. For example, when I’m using Twitter, I use it for news delivery, for customer care, and for connecting with people who share longer-form content. This means my frame of mind when using Twitter is completely different. I expect brands to respond quickly to any questions or concerns, or I want to use it as a jumping board onto a deeper dive on moments and news that brands are sharing. For Pinterest, a user’s intent tends to be focused on the discovery and curation of other users’ content. Similar to Google, users can use Pinterest to search for specific content or products or ideas. They can then create visually appealing and special boards by pinning and grouping the content they discover. Instagram’s move into search has certainly really developed the platform to be similar to this mode but currently Pinterest has the edge, for now. And more importantly for brands, Pinterest users are predominantly female. In fact, women account for about 70 percent of Pinterest users and are about five times as likely to use the virtual scrapbooking tool as men, the largest gender difference of any social network. Pinterest users also tend to skew a little bit older, although the core demographic is still 18-34 year olds, representing 56 per cent of users. Men and women are more evenly represented on Instagram. 50% of the Instagram users are outside of the United States, making for a more global demographic. This network is also more popular with the younger crowd- two-thirds of users are between the ages of 18 and 34, and popularity drops a bit with the older part of this demographic. 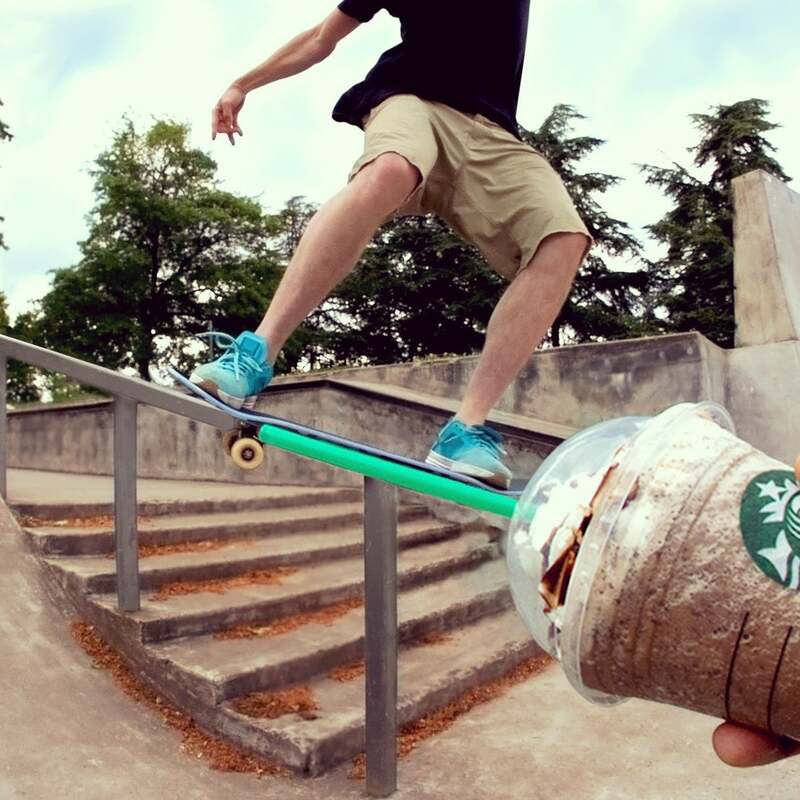 Starbucks MENA - Instagram Creative. Unfortunately, with the growth of Instagram as a marketing tool, I am starting to see what we call "stock image based marketing," which is really lazy, and ultimately, not effective at all. If you take a look at the data that I’ve seen on many an Instagram campaign, you can see that eye-catching, engaging photography is the single most important factor in marketing optimization for any campaign on this platform. For example, just check out what one of the first brands to embrace beautiful photography has managed to do. Ben & Jerry’s understood that featuring mouth-watering images of its famous ice cream it could spread “ice cream euphoria” around the world. It has a strong commitment to its brand values, and it demonstrates this with its focus on building customer connections on a global scale. Ben & Jerry’s is constantly regramming photos posted with related hashtags, as well as focusing on building brand awareness by promoting new and unique flavors through Instagram to generate buzz. Ben & Jerry’s has also proven Instagram ads’ effectiveness by strategically running them using images of its newest flavors or other enticing pictures. After just four ads, Ben & Jerry’s saw a 20% increase in followers. You’ll hear people talk about the need for authentic, real-world photos to drive engagement and they’re right. You can’t keep doing what some brands are really guilty of here in the Middle East, which is just slapping up any old marketing nonsense and hoping "it will do." It won’t- the Instagram community is discerning, and as the social network's name suggests, they go to Instagram to be inspired, delighted and entertained- in an instant. Shoddy shortcuts will not hold up when brands are competing against the likes of National Geographic and some of the world’s best photographers, humorists, fashion brands, and the list goes on. Instagram users refuse to be bored to tears by dull promotional campaigns or posters– and they vote with likes and follows. So what exactly is happening on Instagram, and how can you take part? Well, we know all Instagram advertisers will be able to use a full slate of Facebook targeting tools (remember that Facebook now owns Instagram), including the popular Custom Audiences feature. This will be a key drawing card. Why? Because ads will be hyper-targeted based on demographics: age, gender & interests pulled from Facebook. This gives advertisers a real advantage over organic posts because you can really deliver hyper-bespoke, beautiful content to a precise target, which means that the effectiveness of your creative investment increases enormously. Further, you can retarget your contacts with custom audiences by uploading your customers email addresses. This allows for a deeper connection to the customer relationship. Apart from the reasons already mentioned, Instagram has become the de facto place to reach younger people. Whilst I was on holiday this summer, I met a few people under 22 who wanted to keep in touch. I asked how, assuming they would ask to connect on Facebook? Instead, they said to follow them on Instagram. It is this both factual and anecdotal insight that is important for brands to understand. If you want to play where millennials are highly engaged, then Instagram is now a vital part of the digital ecosystem. Instagram is unique because the content allows for much deeper engagement off the platform as it ties deeply to the wider digital ecosystem of brands. The new functionality allows for a closer tie in to CRM and e-commerce and directly ties delight and participation with a brand to commercial actions. For the smart brands out there that base creative work on data insights, the advertising on Instagram will have several different types of carousel ads with “Shop Now,” “Learn More” & “Sign Up” buttons that link outside the app, which will be incredibly insightful. These CTAs for direct response actions that open an in-app browser mean that brands can fully integrate their social CRM strategy so it moves Instagram from an awareness-only touch point to the end-of-the-purchase-funnel tool. The end-of-funnel formats have a really powerful API to track and measure the value of a brand’s investment. Robust measurement and tracking will allow advertisers total transparency of the value of the investment on the platform against their key metrics, whether that’s awareness uplift, purchase intent or even actual sales the platform - which will allow for a really smart tracking system across the process, and ultimately, a powerful performance marketing matrix. Does This Mean I Shouldn’t Advertise On Facebook? In terms of Instagram and Facebook, I think that both platforms can coexist together. Honestly, it really depends on what your marketing goals are, what business are you in and what you want to achieve. Both platforms provide a way for marketers to really bond with people in a meaningful way– by connecting with the right people. Facebook and Instagram both have very strong targeting capabilities, especially because of the huge prominence on peoples’ mobiles. What I would recommend to all brands looking to invest in Instagram and Facebook is to measure and ask questions. For example, and I’m quoting Sheryl Sandberg here, “track ROI, if you do a car ad for with Instagram one month, how many vehicles were driven off the lot during the ad’s lifetime?” Ultimately, marketers need to do a bit of research and learn what the best products are best for them at the right time to drive their business results. Now that Instagram is opening up its advertising suite, there is a lot of pent-up demand. The rollout of new features over the next several months means that by the end of 2015, Instagram will have a host of new ad products for advertisers, large and small. But this is not the time for marketers to rest on their respective laurels. Sorry, folks, but mediocre creative simply won't work on Instagram. It needs to feel authentic, real, and beautiful. Think of your Instagram feed as the place showcase for beautifully crafted print advertising. You don’t have to invest in lots of really expensive equipment to produce beautiful photographs that look amazing on Instagram. And innovation pays off- for example, check out what Old Spice is doing– leveraging that school boy "Create Your Own Adventure" books passion that clearly resonates with boys and men today, judging by the huge success of Old Spice’s beautiful campaign. Hats off to Wieden + Kennedy who hacked the tagging function on Instagram to gamify the platform through a "Choose Your Own Adventure" social game for Old Spice, filled with robots, retro monsters and meta jokes. Whatever you do, don’t publish stock photography- it’s a huge no-no on Instagram. It feels fake and worse than spam. What all Insta-successful brands do on the platform is encourage truly authentic moment sharing. The challenge for Instagram now is maintaining that same high standard for quality, despite effectively shedding the training wheels- giving more advertisers more freedom, instead of just guiding a few big-budget brands to glossy campaigns. As always, please feel free to share with me your thoughts/comments and personal insights on Instagram. I love to hear back from the community on what I write. Have a truly inspirational day!